SHIBASHI QIGONG : The Self Healing Exercise You Need To Try! Shibashi Qigong places emphasis on synchronizing 18 movements with proper breathing techniques. It is a gentle, beautiful and flowing Qigong exercise routine that is both a joy to do and deeply relaxing. Shibashi Qigong is designed to improve the general health and wellbeing of the practitioner. The gentle rocking motions and stretching movements improve circulation and digestion. The chest exercises and controlled breathing are good for lung conditions and asthma. ‘Shibashi’ is the answer to keep stress in control. The overall effect of the exercise is to reduce mental stress and physical tension carried in the muscles of the body. This Qigong is very effective and easy to learn. Qi Gong is practiced by over 100 million people worldwide as a way to experience a longer, more active life. The gentle, fluid movements increase energy, open the joints, stretch muscles, and enhance balance. Movements can be done either standing or sitting. 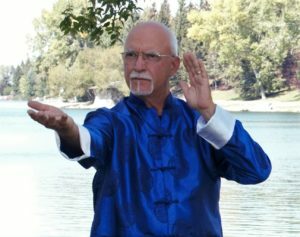 Instructor Mario Argento has emerged as one of todays most accessible and accomplished teachers of Qigong in Calgary. He presents easy-to-learn practices that will help you relieve pain, clear stress and tension, and harness your body’s unequaled capacity for self-restoration.